every summer, a kind of seasonal minimalism takes over. hot weather has a funny way of inspiring simplification, and i find myself liking everything lighter and unfettered this time of year. 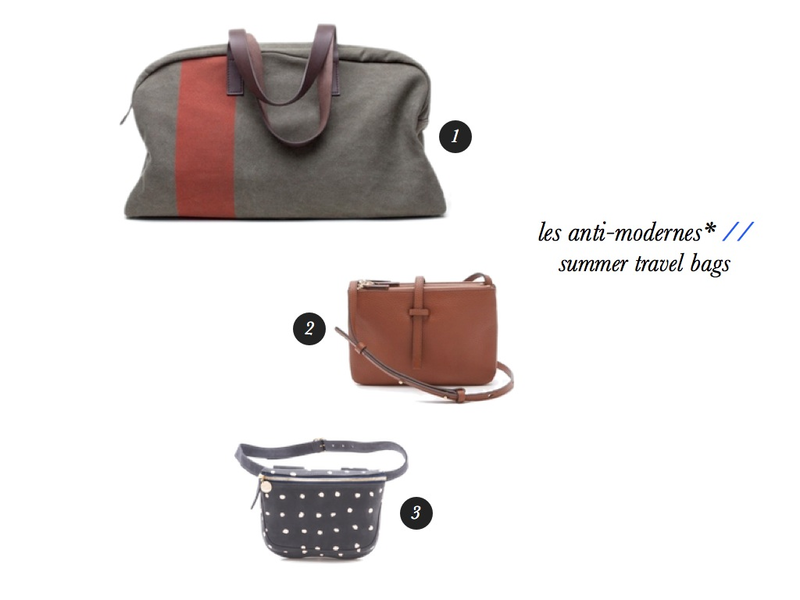 a great summer bag is all about form, function, and preferably hands-free wear. there are more stylishly utilitarian handbag options nowadays, which is certainly good news for those of us who don't want to sacrifice style for pragmatism. i had a feeling when i got my trio crossbody last year that it would be a wardrobe game-changer. it has since proven to be one of the best, most useful purchases i've ever made (so much so, that i have it in two colors). i'm pretty excited about the stylish fanny pack option, because we can all take a page from Rick Steves and rock out secure and hands-free on day trips and summer getaways. P.S. : this super cute bike bag is on major sale right now. do you tend to carry bigger or smaller bags in the summer? The only slight change in the summer, is my mombasa bag does come out a little more in the summer. and liu wen, she is so stunningly beautiful esp in those jcrew ads. I have the EVERLANE Weekender in reverse denim and the only thing that could make it better is a long strap! It's perfect for road trips, but doesn't work for air travel...at least not without a roller cart.